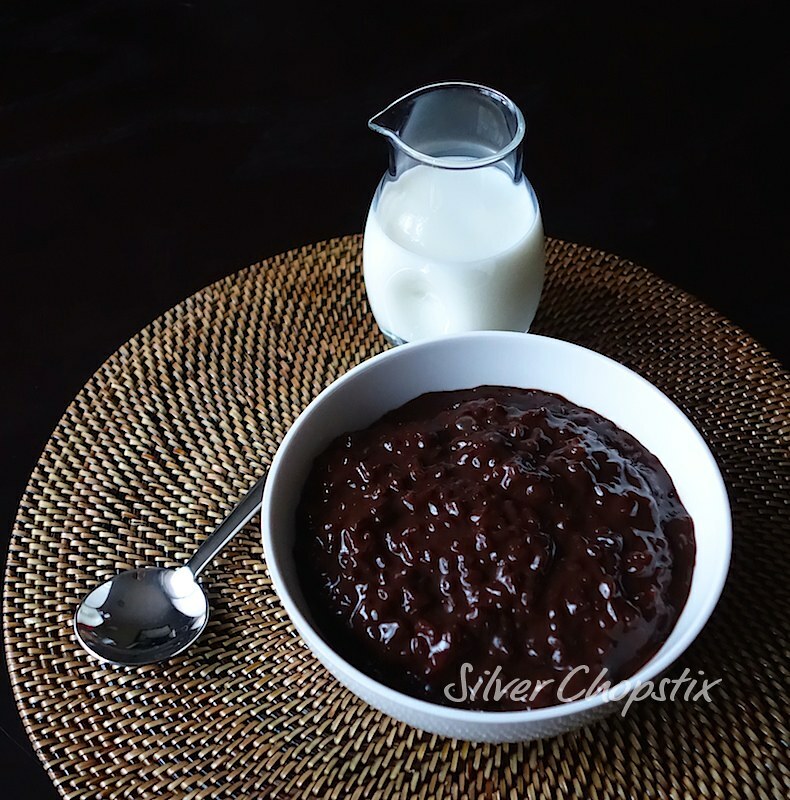 I made a new pot of champorado since my family thought that first one was too rich and chocolatey. They say it was like eating a bar of chocolate. I guess I am the only one who really appreciated it since I am such a chocoholic. I doubled the recipe this time and substituted Hershey’s dark chocolate powder to Hershey’s Natural unsweetened cocoa. I just added a tablespoon of the dark chocolate to make it darker in color. 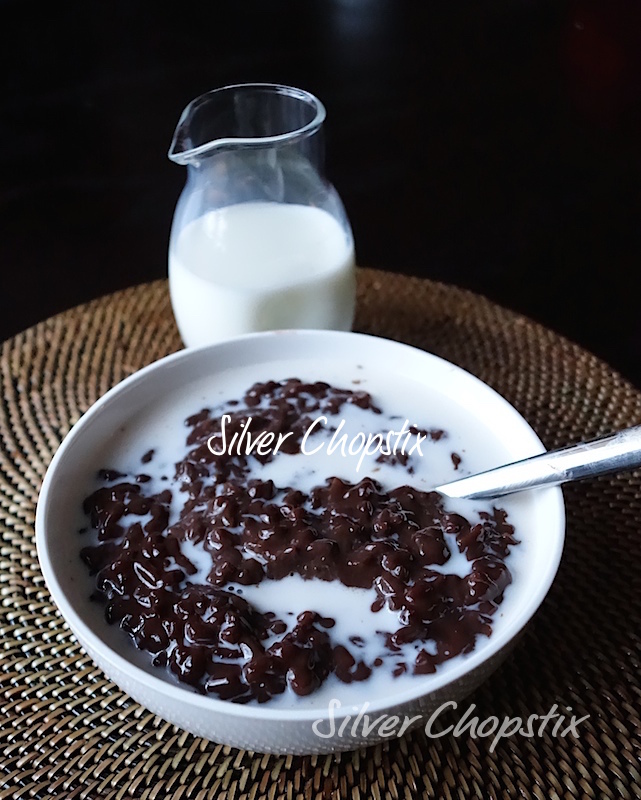 This makes for a decadent chocolate porridge that is not intensely sweet. For those who prefer to use dark chocolate you may adjust the recipe as follows: either make it 2 cups sweet rice instead of 1 (I used the measuring cup that came with my rice cooker) and 6 cups water plus 1 cup to dissolve the chocolate with; or use 1/4 cup dark chocolate powder and 1/4 cup godiva hot cocoa powder and follow the original recipe. 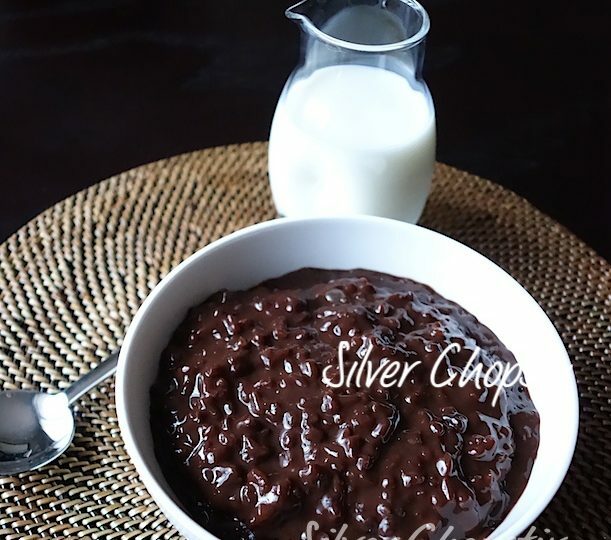 To make place 2 cups sweet rice (glutinous rice) and 6 cups water in a heavy bottomed pan. Note: I used the rice cup measure that came with my rice cooker. Let it come to a boil then add 1/3 cup the natural unsweetened cocoa, 1/4 cup godiva hot chocolate powder and 1 tablespoon of Hershey’s dark chocolate powder dissolved in 1 cup water. Cook while continuously stirring until rice is soft and translucent. Add 1/2 – 3/4 cup sugar to taste towards the end of cooking time. This took about 20 – 25 minutes. Ladle into bowls and pour milk on top before serving. This can be served warm or cold.